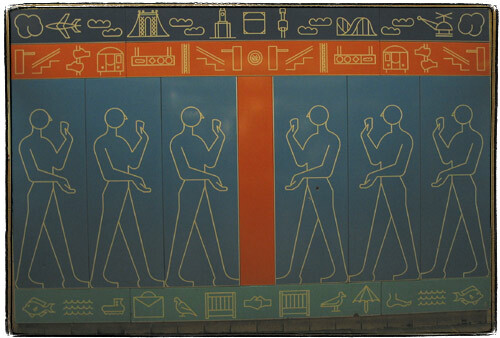 I searched on the Net a bit, and now I know what it’s called: “Kings Highway Hieroglyphics” by Rhoda Yohai Andors, installed in 1987. Many years ago I received a tree identification book for Christmas. I was at my parents’ home, and after all the gifts had been opened I decided to go out and identify the trees in the neighborhood. Before I went out, I read through part of the book. The first tree in the book was the Joshua tree because it only took two clues to identify it. Now the Joshua tree is a really weird-looking tree and I looked at that picture and said to my- self “Oh, we don’t have that kind of tree in Northern California. That is a weird-looking tree. I would know if I saw that tree, and I’ve never seen one before.” So I took my book and went outside. My parents lived in a cul-de-sac of six homes. Four of those homes had Joshua trees in the front yard. I had lived in that house for thirteen years, and I had never seen a Joshua tree. I took a walk around the block, and there must have been a sale at the nursery when everyone was landscaping their new homes -at least 80 percent of the homes had Joshua trees in the front yards. And I had never seen one before! Once I was conscious of the tree, once I could name it, I saw it everywhere. Which is exactly my point. Once you can name something, you’re conscious of it. You have power over it. You own it. You’re in control.